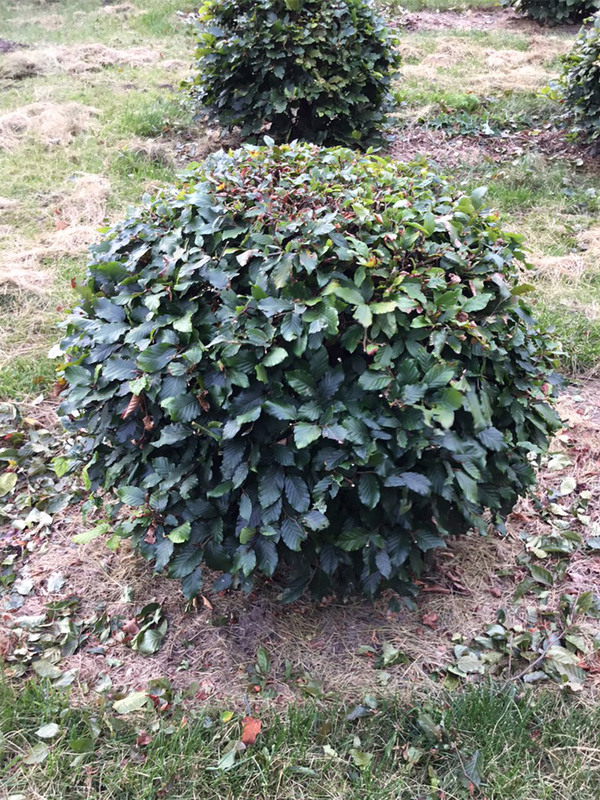 At 60cm this beech topiary is ideal for less formal settings such as small gardens and rural retreats. In a clipped shape, it will not shed its leaves and provide changing colours for each season. The native, deciduous beech family is widely famed for its domed crown, foliage and autumn colour. The common beech variety features a 'zig zag' shaped leave up to 10cm (4 in) long which are pale green at first, turning glossy dark green, then beautiful shades of yellow to orange-brown in autumn. Like hornbeam, beech has marcescent leaves i.e. dead leaves that are held on the plant through winter, before being pushed off by newly emerging leaves in spring. Fagus was the god of beech trees and the leaves were thought to have medicinal purposes by relieving swellings. Beeches are very tolerant of a wide range of well-drained soils including chalk and limestone. Can be grown in full sun or partial shade. Only specialist shade tolerant plants will survive underneath a beech canopy which is characterised by a dense carpet of fallen leaves and husks. Ideal as a good windbreak in exposed situations; beech is a popular plant for both hedging and pleaching. Did you know that pleaching is a technique of interweaving living and dead branches through a hedge for stock control? Trees are planted in lines, the branches are woven and grow together in close contact.